Department hopes to add new members to its firefighting staff. 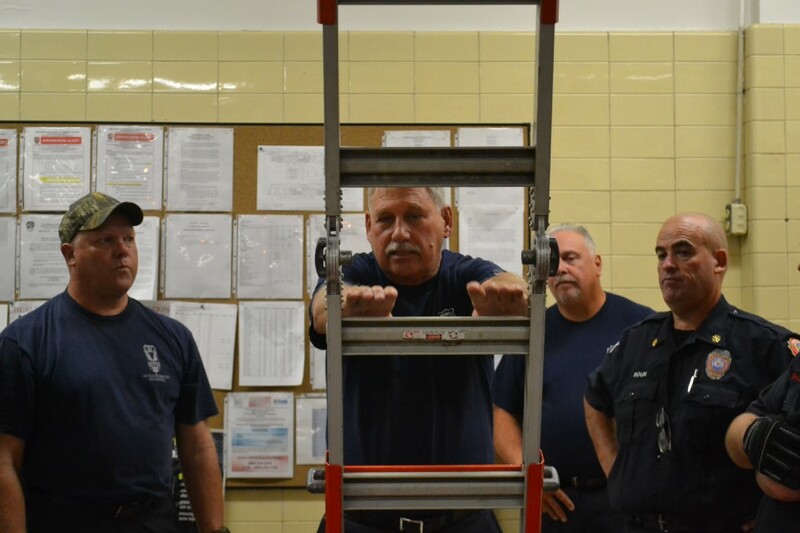 Vice President John Miller (center) demonstrates proper ladder use with (from left) Keith Gindville, John Skowronski and Howard Roun. It’s a Monday night at Independence Fire Department on Broad St. in Palmyra and all hands are on deck. Every month the volunteer staff get together to run drills and make sure everyone is familiar with the wide array of equipment housed within their building. Many of the other volunteers share Fries’ sentiment. Ask Jules Dore’, member for the last 49 years, what keeps him hanging around the department and he’ll tell you “it’s the fellas.” Chief Richard Dreby couldn’t agree more. “Everyone’s looking out for each other,” Dreby says of the sense of community the members of his department feel. Joanne Huber, a member for the last 17 years, feels as much a part of the family as her male counterparts, despite being one of only four other women in the department. Before becoming a firefighter she was a volunteer EMT. “Every time I came around a fire I wanted to do something,” says Huber. The Independence Fire Company has served its community since it was established in 1887 and is currently reaching out to that same community to ensure it can keep on serving. As a volunteer organization the department relies on local individuals giving a piece of their time and signing up to become members. “Across the state and across the country it’s been tough to get people to join. Some departments could be thriving and some departments could be having some issues,” says Dreby. The need for new recruits remains despite the department’s success with junior members like Fries and their latest addition, Ken Keisler. A veteran with ten years of service to the U.S. armed forces under his belt, Keisler felt a similar call to serve when he signed on to become a firefighter. He found common ground with the members of the department and compares their camaraderie with his experience in the military. “It’s the same type of atmosphere, a family environment,” says Keisler. Chief Dreby is seeking out any willing individual as long as they express an interest in their community, possess a level head and want to get involved in helping others. He especially wants to see more young people signing up. “If we don’t continue to bring in the younger generation to replace the older generation eventually volunteers may go away,” says Dreby. A night running drills concludes with a hearty meal prepared by President Brian Cattell. Chicken sandwiches, pulled pork, soup and potato salad are on the menu. New members eat first and everyone gets their fill. As they congregate it’s easy to see why so many members think of their fellow firefighters as family. For information about joining contact Richard Dreby (856) 829–0805 or visit the department’s website www.palmyrafire.org and fill out an application.